"On January 1, 1994, the day the North American Free Trade Agreement came into force, the indigenous Zapatista National Liberation Army (EZLN) took over five towns and 500 ranches in southern Mexico. 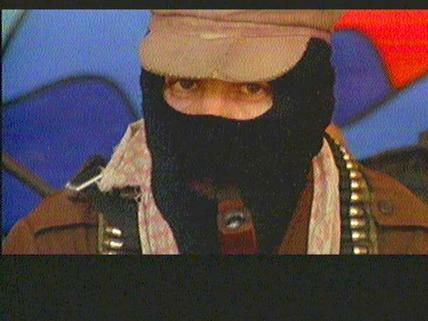 Three years later, the Zapatistas and their charismatic leader, guerrilla poet Subcomandante Marcos, are trapped in the Locandon jungle. Surrounded by 30,000 Mexican troops, they struggle to maintain a nervous ceasefire. [...]"
National Film Board of Canada. "NFB -- A Place Called Chiapas." National Film Board of Canada. http://www.onf-nfb.gc.ca/eng/collection/film/?id=33634.